The death toll in Indonesia’s quake-tsunami disaster nearly doubled to more than 800 Sunday, as ill-equipped rescuers struggled to reach scores of trapped victims, health officials resorted to mass burials and desperate residents looted shops for food and water. “The casualties will keep increasing,” said national disaster agency spokesman Sutopo Purwo Nugroho, whose agency announced 832 deaths. Indonesian Vice-President Jusuf Kalla said the final death toll in the north of Sulawesi island could be in the “thousands” since many regions have still not been reached. Indonesia’s Metro TV on Sunday broadcast footage from a coastal community in Donggala, close to the epicenter of the quake. Some waterfront homes appeared crushed but a resident said most people fled to higher ground after the quake struck. “When it shook really hard, we all ran up into the hills,” a man identified as Iswan told the TV. Indonesian President Joko Widodo arrived in the region Sunday afternoon. In Palu on Sunday aid was trickling in, the Indonesian military had been deployed and search-and-rescue workers were doggedly combing the rubble for survivors — looking for dozens feared trapped under one hotel alone. “Communication is limited, heavy machinery is limited… it’s not enough for the numbers of buildings that collapsed,” Nugroho said. The 7.5-magnitude quake struck Friday, sparking a tsunami that ripped apart the city’s coastline. Save The Children program director Tom Howells said access was a “huge issue” hampering relief efforts. “Aid agencies and local authorities are struggling to reach several communities around Donggala, where we are expecting there to be major damage and potential large-scale loss of life,” Howells said. Dozens of corpses lay in an open courtyard at the back of a Palu hospital, baking under a fierce tropical sun, with only one building separating it from an open triage site on the opposite side. “I have one child — he’s missing,” Baharuddin, a 52-year-old Palu resident, told AFP as he stood on floor tiles smeared with blood. The disaster agency said it believed about 71 foreigners were in Palu when the quake struck, with most safe. Amid the leveled trees, overturned cars, concertinaed homes and flotsam tossed up to 50 meters inland, survivors and rescuers struggled to come to grips with the scale of the disaster. On Saturday evening residents fashioned makeshift bamboo shelters or slept out on dusty playing fields, fearing powerful aftershocks would topple damaged homes and bring yet more carnage. C-130 military transport aircraft with relief supplies managed to land at the main airport in Palu, which reopened to humanitarian flights and limited commercial flights, but only to pilots able to land by sight alone. Satellite imagery provided by regional relief teams showed severe damage at some of the area’s major ports, with large ships tossed on land, quays and bridges trashed and shipping containers thrown around. Hospitals were overwhelmed by the influx of injured, with many people being treated in the open air. There were widespread power blackouts. “People here need aid — food, drink, clean water,” said Anser Bachmid, a 39-year-old Palu resident. Dramatic video footage captured from the top floor of a parking ramp as the tsunami rolled in showed waves toppling several buildings and inundating a large mosque. “This was a terrifying double disaster,” said Jan Gelfand, a Jakarta-based official at the International Federation of Red Cross and Red Crescent Societies. Images showed a double-arched yellow bridge had collapsed with its two metal arches twisted as cars bobbed in the water below. A key access road had been badly damaged and was partially blocked by landslides, the disaster agency said. Friday’s tremor was also felt in the far south of the island in its largest city Makassar and on neighboring Kalimantan, Indonesia’s portion of Borneo island. As many as 2.4 million people could have felt the quake, the disaster agency said. The initial quake struck as evening prayers were about to begin in the world’s biggest Muslim majority country on the holiest day of the week. Indonesia is one of the world’s most disaster-prone nations. Earlier this year a series of powerful quakes hit Lombok, killing more than 550 people on the holiday island and neighboring Sumbawa. Indonesia has been hit by a string of other deadly quakes including a devastating 9.1-magnitude earthquake that struck off the coast of Sumatra in December 2004. That Boxing Day quake triggered a tsunami that killed 220,000 throughout the region, including 168,000 in Indonesia. Scientists expressed surprise at the size of the tsunami that devastated the Indonesian city of Palu on Friday, saying an earthquake like the one that preceded it would not necessarily spawn such destructive waves. “We expected it might cause a tsunami, just not one that big,” said Jason Patton, a geophysicist who works for a consulting firm, Temblor, and teaches at Humboldt State University in California. 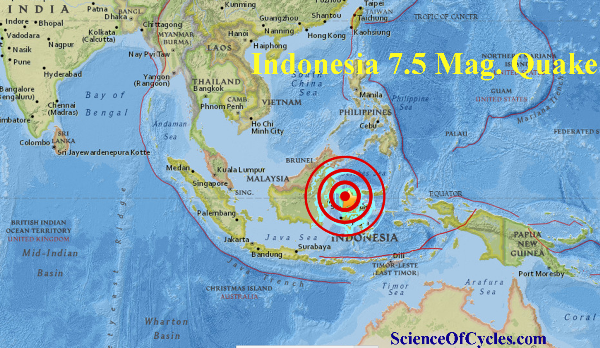 The 7.5-magnitude quake, which struck in the early evening, was centered along the coast of the island of Sulawesi about 50 miles north of Palu. Shortly afterward — within 30 minutes by some accounts — waves as high as 18 feet crashed ashore in the city, destroying buildings, smashing vehicles and killing hundreds of people. The high casualty toll may also reflect Indonesia’s lack of advanced systems for tsunami detection and warning, tsunami experts said. 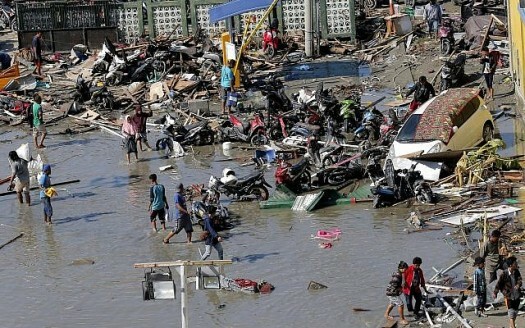 Other communities on Sulawesi, including the city of Donggala, were also hit by the tsunami, although there are as yet few details of the destruction or death toll outside of Palu. Catastrophic tsunamis are often the result of so-called megathrust earthquakes, when huge sections of the Earth’s crust are deformed, moving vertically along a fault. This suddenly displaces enormous amounts of water, creating waves that can travel at high speed across ocean basins and cause destruction thousands of miles from the quake’s origin. The 2004 Indian Ocean tsunami, which had waves as high as 100 feet and killed nearly a quarter of a million people from Indonesia to South Africa, resulted from a 9.1-magnitude megathrust quake in Sumatra. By contrast, the fault that ruptured on Friday was a so-called strike-slip fault, in which the earth movement is largely horizontal. That kind of movement would not ordinarily create a tsunami. But under certain circumstances it can, Dr. Patton said. A strike-slip fault might have some amount of vertical motion that could displace seawater. Or the fault’s rupture zone, which in this case was estimated to be about 70 miles long, may pass through an area where the seafloor rises or drops off, so that when the fault moves during the quake, it pushes seawater in front of it. Another possibility is that the tsunami was created indirectly. The violent shaking during the quake may have caused an undersea landslide that would have displaced water and created waves. Such events are not uncommon; several occurred during the 1964 9.2-magnitude Alaska earthquake, for example. Dr. Patton said a combination of factors may have contributed to the tsunami. Studies of the seafloor will be crucial to understanding the event. “We won’t know what caused it until that’s done,” he said. The tsunami could also have been affected by Palu’s location at the end of a narrow bay. The coastline and the contours of the bottom of the bay could have focused the wave energy and guided it up the bay, increasing the wave height as it approached shore. Such effects have also been seen before. Crescent City, Calif., has been hit by over 30 tsunamis, including one after the 1964 Alaska quake in which 11 people were killed, because of the contours of the seafloor in the region and the city’s topography and location. Whatever the genesis of the waves, a 7.5-magnitude quake would not be expected to create an ocean-wide event, but rather a more localized one, as was the case on Friday. With the tsunami generated so close to Palu, there was little time for people to escape. A tsunami warning was issued by the government and was lifted about half an hour after the quake, apparently after the tsunami hit Palu. Indonesia currently uses only seismographs, global positioning system devices and tide gauges to detect tsunamis, which are of limited effectiveness, said Louise Comfort, a professor at the University of Pittsburgh graduate school. She has been involved in a project to bring new tsunami sensors to Indonesia. In the United States, the National Oceanic and Atmospheric Administration has a sophisticated network of 39 sensors on the ocean bottom that can detect extremely small pressure changes indicating the passage of a tsunami. The data are then relayed via satellite and analyzed, and an alert is issued if required. Dr. Comfort said that Indonesia had a similar network of 22 sensors but that they were no longer in use because they were not being maintained or had been vandalized. The project she is working on would bring a new system to Indonesia that would use undersea communication to avoid the use of surface buoys that could be vandalized or hit by ships. Dr. Comfort said she had been discussing the project with three Indonesian government agencies. Plans to install a prototype of the system in western Sumatra were delayed this month. “They couldn’t find a way to work together,” she said. The death toll on the island of Sulawesi stands at 832 people, but officials expect that number to climb as rescuers on Monday continue to sift through the destruction left by a powerful earthquake and tsunami. Two days after a 7.5 magnitude earthquake hit the island and 3-meter-high waves crashed onto its northern shore, authorities continued combing through chunks of concrete and lumber searching for survivors. 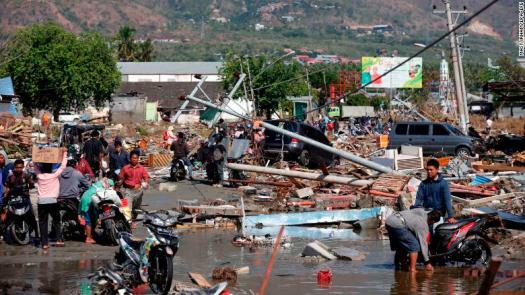 Getting into Palu, which saw the worst of the destruction, has been difficult. An airport runway was damaged, limiting flights into the area, and several roads and bridges have been washed out, said Jan Gelfand, who heads the International Red Cross delegation in Indonesia. People are afraid to go inside because of the incessant aftershocks, he said. Cut off from the rest of the island because communications are down, people in the area are in desperate need of water, food and health care, Gelfand said. The Red Cross is trying to get kitchens, surgical teams and mobile clinics into the region. “There’s a large, large need, and I don’t think we’ve quite seen the worst of things yet,” he said. Indonesian Disaster Management Agency spokesman Sutopo Purwo Nugroho estimates 2.4 million people were affected by Friday’s earthquake. Seventy-one foreigners were in Palu at the time of the quake and most were safely evacuated to Jakarta. At least five foreigners, including three French nationals as well as a Malaysian and a South Korean national, are unaccounted for, he said. Survivors walked through floodwater and piles of debris. A shopping mall turned into rubble and the large dome of a mosque collapsed in Palu, the capital city of Central Sulawesi Province and home of 350,000 people. Homes and businesses along the coast, many of them tin-roof shanties, were washed away, as were vehicles. Damaged hospitals were forced to shut down. A large number of bodies from the earthquake and tsunami in Donggala District and Palu will be buried in mass graves on Monday, Brig. Gen. Dedi Prasetyo told Indonesian state media on Sunday. “Most of the corpses have started rotting so that we are going to bury them in mass graves as quickly as possible to prevent them from posing a risk of epidemic diseases,” Prasetyo said. The lack of heavy equipment and personnel has slowed rescue efforts in the coastal city, where workers were scrambling Sunday to rescue about 50 people trapped beneath the debris of a collapsed hotel. “I am asking all of you to work day and night to complete every task related to the evacuation. Are you ready?” he asked the country’s military. Bambang Soesatyo, speaker of the People’s Representative Council and a member of Golkar Party, told ANTARA News on Sunday the government needs to increase the scale of relief operations to the affected area. Many people had to sleep on the side of the road, Soesatyo said, and many patients were treated in open spaces. Residents are still worried about aftershocks and are afraid to return home, he said. “The relief team should immediately try to provide these needs,” Soesatyo said. Gelfand said help is also on the way for the fishing towns of Donggala and Mamuju, two areas feared to be heavily devastated. “The Indonesian Red Cross is racing to help survivors, but we don’t know what they’ll find there,” Gelfand said. The quakes come weeks after a trio of earthquakes hit several islands in the South Pacific and Indonesia, including Lombok, which is still recovering from the effects of an August 5 earthquake that killed more than 430 people. Rescue workers in Indonesia continued a desperate search for survivors Sunday, two days after a powerful earthquake hit the island of Sulawesi and triggered a tsunami, killing more than 400 people. After the 7.5-magnitude earthquake hit Friday, water smashed into buildings and swept away homes in the coastal city of Palu, home to 350,000 people. Indonesian Disaster Management Agency spokesman Sutopo Purwo Nugroho put the death toll at 405 early Sunday, based on the number of bodies that had been recovered. More than 400 people were badly injured, Sutopo said. Many victims were still buried under the rubble of buildings and houses, Sutopo said, and evacuation efforts were slowed by lack of heavy equipment and personnel. Electricity and communications have been cut off, making it difficult to assess the damage in Palu and nearby fishing community of Donggala, Sutopo said. “It is not just the people in the large urban areas. There are a lot of people also living in remote communities who are hard to reach” Jan Gelfand, head of the International Red Cross in Indonesia, told CNN. Ash spewing from the Popocatepetl volcano has reached the southern neighborhoods of Mexico’s capital. The National Center for Disaster Prevention warned Mexicans on Saturday to stay away from the volcano after activity picked up in the crater and it registered 183 emissions of gas and ash over 24 hours. The center was monitoring multiple rumblings and tremors. Images on social media showed thin layers of ash coating car windshields in neighborhoods of Mexico City such as Xochimilco. Geophysicists have noticed an increase in activity at the volcano that sits 45 miles (72 kilometers) southeast of the capital since a 7.1-magnitude earthquake rocked central Mexico in September 2017. 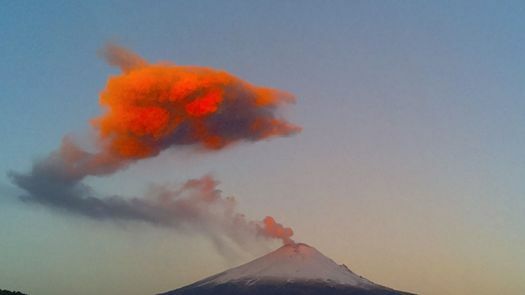 The volcano known as “Don Goyo” has been active since 1994. Cosmic rays have been discovered coming out of Antarctica. No high-speed particle we know of could possibly go in one side of the Earth and come out the other….that is until now. According to the Standard Model (SM) of physics, this should not be possible. In September, a paper was submitted for peer review led by astrophysicists Derek Fox at Penn State University. 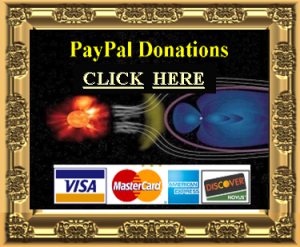 Fox reports the new particle discovery was detected by a surface-based Antarctic neutrino detector called IceCube and also by ANITA (Antarctic Impulsive Transient Antenna) which seeks cosmic rays by atmospheric balloons suspended of Antarctica. 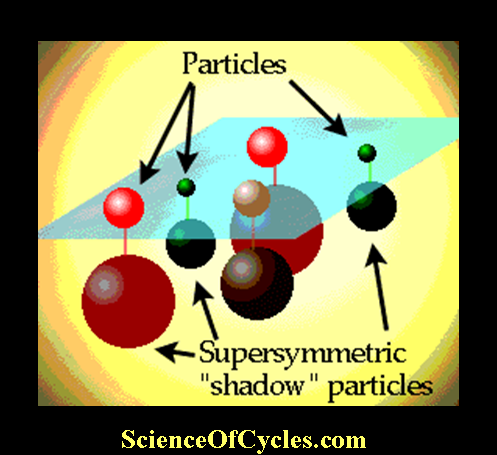 In the teams published paper, Fox explains; “We have demonstrated that SM models cannot explain the ANITA anomalous events if they are correctly interpreted as upgoing UHECR (Ultra High Energy Cosmic Rays) with exit angles of 27◦ to 35◦.” Fox has termed the newly discovered particles as SEECRs (Sub-Earth-Emergent Cosmic Rays). Astronomers have unveiled the first gamma-ray maps of the Sun, which detail the ebb and flow of these high-energy photons over nearly a decade of observations. The data raise more questions then they answer. When speedy interstellar protons known as cosmic rays slam into the Sun, they produce gamma rays that can be observed from Earth. By tracking how this gamma ray flux changes with time, researchers hope to better understand how the Sun interacts with its surroundings and how those interactions relate to its ever-changing magnetic engine. Tim Linden, of The Ohio State University in Columbus, and colleagues analyzed gamma-ray data of the Sun taken by NASA’s Fermi space telescope from 2008 to 2017. This period covered most of the last solar cycle, the latest round of the 11-year oscillation in the Sun’s magnetic activity. 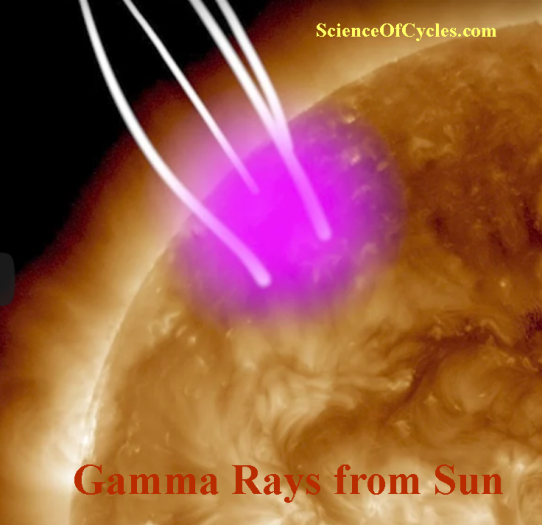 They found that the Sun’s poles steadily emitted gamma rays throughout the cycle. But surprisingly, the flux from the solar equator varied dramatically, outshining the poles during the solar minimum in 2009 before going largely quiet in gamma rays for the rest of the cycle.